There's not a snowflake in sight but the heat wave that has hit Lancashire these last few weeks has led to the unusual sight of gritters being used in the summer sun. As we all know, they are normally deployed during cold snaps to stop road surfaces from freezing. 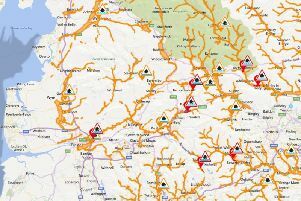 Gritters on the roads in Cumbria. But the current heatwave has led to road surfaces softening in some places, which can then stick to vehicle tyres, and make the surface slippery. Crushed rock particles such as granite dust are being spread by six of Lancashire County Council's gritting vehicles to create a non-stick layer between roads and vehicles. Councils in Cumbria, Doncaster and Hampshire are also among those using gritters this week. Lancashire County Coun Keith Iddon, cabinet member for highways and transport, said: "The prolonged spell of hot weather is causing the bitumen to soften on roads all over the country. "The problem is that it can start to stick to car tyres, damaging the road by stripping the surface off, and become slippery, which is a potential safety problem. "We've been using around six of our gritting fleet to apply granite dust where this is happening. This creates a barrier to stop it sticking to people's tyres, and improve skid resistance. "Now this problem has started it will carry on until the weather cools off so we're sending the gritters out every day at the moment to those places where we know this is a problem, as well as responding to any new locations picked up by our inspectors or reported by the public. "In some places we're also putting out signs with advisory speed limits to encourage vehicles to slow down for safety. "It's not the first time we've had to do this in Lancashire, and our climate means that it doesn't happen very often. "If permanent damage is caused to any of the network, and once the weather cools down, we'll assess these locations for any repairs which may be needed. "In the meantime, I'd ask people to take particular care on the roads, observe any advisory speed limits in place, and report any problems to us which we may not already be aware of." RAC spokesman Simon Williams said: "Many motorists could be forgiven for thinking the sight of gritters on the road in the summer is a mirage caused by the heat. "But they should actually be relieved councils have taken action as road surfaces could easily suffer hard-to-repair long-term damage. "And with many local roads already in a dire state from the harsh winter weather, this is the last thing drivers and their vehicles need." Motorists who find sticky tar on their vehicles are advised to wash it off with warm soapy water.